Will the whole world become your digital world? And vice-versa? What if we made the window into a digital device called a Teleportal? What if that were a two-way network that turns the Earth and all its digital resources into one digital room with everyone in it? What if that digital room were you-centered and you gained immense abilities from it? What if it were delivered to the screens you already use today? Could your life’s dreams be as close as your screens—even the one in your hand? Could we deliver tomorrow’s Digital Earth now, decades before it’s expected? From a totally unexpected vantage point, the future became visible. Standing at a window and looking through it triggered a flood of realizations that spilled into years of confidential work. With all the digital devices we use today, we haven’t digitized the window. We have added video communications to many devices and we even call Microsoft’s PC operating system “Windows,” but our windows are still dumb sheets of glass in walls. We don’t even stand in front of our windows and enjoy them for long. We already know what’s outside. It doesn’t change. It’s nice, but boring. 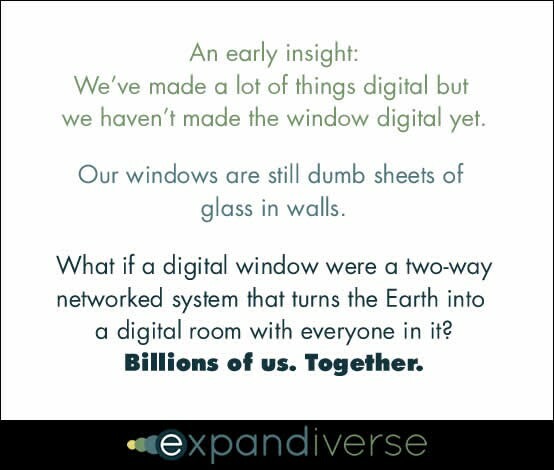 But what if a digital window were a two-way, networked system that turns the Earth into a single digital room, with everyone in it? Two-way. Interact with the other side. People worldwide talk back to you. Add parallax, depth of field and high quality video/audio, so everyone moves and looks like they’re in the same room, separated only by a sheet of glass. Imagine if all digitally connected people were in that new connected room. Years were spent turning this into technology and IP. Next add booster rockets to these new digital windows, and name them “Teleportals:” Converge computing, communications, the Internet, television, music, work, e-commerce, entertainment and much more. Combine people, services, places, tools and resources. Make our complete digital world accessible from every digital window. Make all the connections continuous, as the power of our devices exponentially increases to handle this. Morph all our screens into one family of Teleportals. Their styles include wall-size to desk-size, tablets to hand-held, pocket-size to wearables. And include new formats when they emerge, like glasses and projectors. Constantly improve the video and audio processing until your Teleportals feel better than real. Make them more powerful than physical reality, too, with remote control over many parts of our increasingly powerful digital world. With all your Teleportals instantly responsive, their connections always on and ready to do your bidding. Provide one consistent, adaptable interface to fit the size and power of each of your screens. 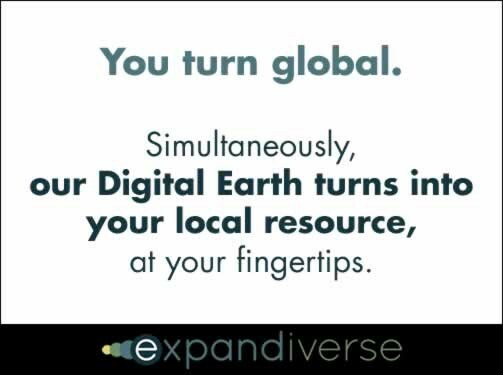 Your Teleportals put you in one digital world you can use easily and fully from every device. From everywhere, whether in Manhattan or a small village. Since people naturally focus on themselves and make social connections, our physical world revolves around us. Teleportals can reflect us the same way. They’re designed so they can be “you-centered” and work like automatic doors. As you turn to one it recognizes you and automagically opens your “Shared Planetary Life Spaces.” Your people, services, places, tools and resources are all on and connected. All you do is “focus” a connection and that part of your world is “here” for you. Instantly. When you leave that Teleportal it turns off automagically. It saves “where you are” in the architecture behind your Teleportals. As soon as you turn to your next Teleportal it retrieves and restores your Shared Spaces for you. Your continuous, always on digital world follows you from screen to screen. If you’re with people, they stay with you as you switch. If you’re using software, tools and data files, these stay in front. If your “location” is a displayed place like your office where you work, that follows you to your next device. Or if you’ve blended a combination then that’s what you see when you switch to the next screen. Can digital boundaries remove the physical world’s limits? You’ll be interested in every part of your life, because you’ll make each of your Shared Spaces what you want. You can block anything you don’t want in your Shared Spaces. These visible boundaries let you filter in what you like and shut out what you dislike, so your screens reflect how you see the world. Your boundaries also expand your privacy, with public, private or secret Shared Spaces. Of course you’ll control your boundaries sensibly. You’ll be public when you focus your friends, private when you focus in your employer’s work spaces, and secret when your financial accounts are up front. But who wants to be sensible all the time? You can also enjoy multiple personal identities that are public, private or secret. Let your imagination go and enjoy your dreams as some of life’s best adventures await in some of your Shared Spaces. Beyond a first kiss, greater than a first love, outshining the “first time,” you will defeat death in ways medical science can’t. Rather than extending your life by hundreds of years, you could add more identities and lives into your one short lifetime. You’ll explore the world, becoming a global person who learns how to feel at home everywhere you decide to be, with many different kinds of people. You’ll turn the Earth into your personal home and resource, in ways it’s never been before. Processing will include speech recognition, with automatic translation for those who speak different languages. It will be clear that everyone’s everyday lives, and our global adventures, include everyone. Once we see how to have the lives we want, we will reach for our dreams. Life will turn into entertainment, and entertainment into new types of lives and lifestyles. Your dreams for your life will be as close as your screens. As a global person, the Earth will no longer be limited to the world’s wealthiest elites. Teleportals will make it yours. Ours. Everyone’s. Not to be outdone, those who want serious can sit in the classrooms of the Ivy League’s best professors, attend live TED talks all over the world, or pack “invested in” politicians’ virtual town halls to discuss their well spun “My job is to monitor and lock you down!” argument. Your worlds will be what you choose, including who you choose to be and which realities you live in. For the first time in history physical reality won’t limit you. Instead, you’ll control trans-border digital reality, with the whole world as your personal resource. When you can include or exclude anything you’ll decide when you want to be formal, frivolous or fantastic. Your powers will grow rapidly as Teleportal capacities advance at the exponential speed of Moore’s law: Twice as powerful in 18 months, 4X in 3 years, 32X in 6 years and 128X in a decade. 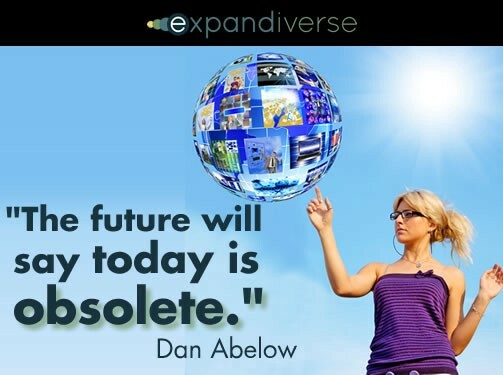 Exponentially, in two decades you’ll be over 10,000 times more powerful. You’ll redesign your displays in real time, creating your world and broadcasting your preferred realities in your video and audio. Reality designers can develop custom realities — with or without music tracks — and broadcast them for millions to explore, enjoy and switch between. During breakfast you might blend in a living Amazon rainforest, lunch with Star Wars fans at a simulated Tatooine restaurant, and hold an afternoon meeting in the Louvre. There’s no doubt, you’ll make your worlds the best you can imagine. The future wasn’t just a digital window any more. Years of confidential work produced 750 pages of IP filings and 1,500 pages of documentation so this future could be built today. It started to become clear what our technology possibilities could be if we accelerate tomorrow’s world into today, decades early. Sooner than you expect, you might become the person you always imagined you could be. A person who controls your worlds, and enjoys the best lives you can discover. You’ll look around with new eyes. Your digital connections will be continuous, just like physical reality. Walk into a room and the physical world is always there. Turn to your Teleportals and your digital world is always there. In your Teleportals, you-centered Shared Spaces will make you feel all-knowing, powerful and special. You’ll realize you’ve arrived in tomorrow, with the power to make you the best you can be. Your Teleportals and Shared Spaces will deliver a world full of people, places, activities and opportunities locally, at your fingertips — with the services and resources you need to live globally at a level far beyond today. You will explore a much bigger life, and grow into abilities you can’t even imagine. Not for a future generation. For today. 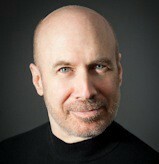 With economic acceleration for this decade’s economies, the companies that lead this — and you, me and everyone. Could economic and market size growth take off on a scale never before imagined, and start Universal Prosperity?